Some of the most important visionary experiences in the Christian New Testament can be understood as spiritual travel. While the number of examples listed below from scriptures are small, they are only samples from a larger set. But even with this limited number, there are enough to show that the concept of spiritual travel has been unjustifiably ignored or devalued by the leaders in these Western traditions. In the author's view, the topic of spiritual travel needs to be revisited by scholars and religious leaders to first document, and then assert the importance of spiritual travel in Western religious scripture and practice. The experience of "being caught up in the spirit" is spoken of a number of times in the New Testament. For Christians who value the authority of Saint Paul, an important biblical passage is Paul's story of the man who was transported up to the third heaven in Corinthians 12. This experience clearly fits our criteria for spiritual travel (assuming the man did not visit heaven while actually in his physical body). Some scholars believe Saint Paul was the person who experienced heaven but that he described the experience as happening to another man because of his humility. This story is important because it is a passage from the new testament that describes in literal terms the soul leaving the physical body and traveling to heaven. It does this when Saint Paul questions: "Was the man in his body when he visited heaven or not?" By wondering about these two possibilities, Saint Paul is stating that he believes that the soul of a living person can leave the body, visit heaven, and return to the body to tell the story of what happened. This is precisely what appears to happen in deeper spiritual travel experiences. The most pronounced and longest spiritual travel experience in the new testament is in the book of Revelation. In Revelation 4, the description of spiritual travel is clear and unambiguous. This following passage from Revelation precedes the famous section where Saint John meets the four heavenly figures with the faces of a human, an eagle, a lion, and an ox. This spiritual travel experience appears to go on almost to the end of the book of Revelation. Saint John never does describe returning from heaven to his physical body, but clearly he had to return to write the Book of Revelation. Paul's conversion experience where he had a vision of light on the Road to Damascus (Acts 9) is unclear as to whether it qualifies as spiritual travel since it is unclear whether he left his body. It may or may not have been a spiritual travel experience. This vision which blinded him for three days was a crucial turning point in the history of the early church since Paul, after his conversion, was the primary figure who spread Christianity to the Gentiles. One indication that the vision may qualify as spiritual travel was that Paul lost his ability to see. This might indicate his other senses also failed during the experience. If this were the case, his experience might meet our criteria for spiritual travel since if all of his senses were inoperable, his vision may have occurred during an out-of-body state. Jacob's dream-vision of a "stairway resting on the earth, with its top reaching heaven, and the angels of God ... ascending and descending on it" in Gen 28-12 presents an image of a gateway to heaven. Jacob concludes in Gen 28-17 "How awesome is this place! This is none other than the house of God; this is the gate of heaven." Jews believe that the place of Jacob's dream which became Beth El (an early Jewish ritual center that was in competition with Jerusalem) where people can contact God through prayer and sacrifice but mainstream Jews did not normally do spiritual travel to enter through this "gate of heaven". However the existence of such a gate implies that the mystically inclined might be able to use this and other such gates to enter heaven via spiritual travel. Ezekiel 40 is another example of spiritual travel in the Hebrew Bible where a vision transports the prophet to what appears to be a physical location (the land of Israel). Dreams are also a very important element in the Hebrew Bible. Numerous prophets such as Job, Isaiah, Jeremiah, Daniel, and Amos have visionary and prophetic dreams. The following passage from the Song of Solomon actually describes Solomon waking up in a dream which is something that happens often in spiritual travel. In the following famous passage from Joel, the importance of dreams for the believer is emphasized. Implied in this statement is that spiritual dreaming is an important part of life, and that the ideal world or the "end times" would contain many individuals who had spiritual and visionary dreams. Since many visions and dreams in the Hebrew Bible appear to involve spiritual travel, it would seem that the Bible recommends this practice. If it is good for the prophets, it may be just as valuable for ordinary men and women. In the next passage from Daniel, the concepts of visions and dreams is equated. In the Hebrew Bible, the two are very close and sometimes confused, or spoken of using the same terminology. In addition to the above examples of spiritual travel in the Hebrew Bible, there are prophets who enter heaven while alive and sometimes appear to take their body with them. Elijah saw a "chariot of fire" and "went up by a whirlwind into heaven" apparently never to be seen again by those who witnessed this event. This cannot be classified as spiritual travel since the prophet never returned but it has some clear similarities. Despite these examples, there are those that strongly object to seeking spiritual travel experience in a Christian context. Here are some objections offered by such traditionalists. Some have made the argument that since the Bible does not explicitly recommend seeking out-of-body experience, it must be wrong or evil. This claim about it not being recommended may or may not be true. However, assuming it is true, there are many things and ideas in the modern world that the Bible never anticipated and therefore could not sanction. Modern interpretations that justify such doctrines and practices as inerrancy, fundamentalism, charismatic activities, Trinitarianism, Catholic sacraments, intercession, and Christian Science (and its version of faith healing) could all be claimed to "not be in the Bible". Similarly, the prohibition against abortion is certainly not in the Bible but this does not stop biblically-focused Christians from having strong ethical objections to the practice based on the vague concept of "Christian values". Some Christian groups make arguments about religious practices not being biblical to justify their own interpretations and denigrate the interpretations of other Christian groups. The "not in the Bible" argument if interpreted narrowly could lead the practices and beliefs of many mainstream Christian sects being classified as un-Christian. In addition, the modern world and technological progress could be easily rejected based on this same argument. If the Bible does not say it is good, then it must be evil. However, I will note that few Christians are railing against the evils of antibiotics to heal the sick, or the evils of the high speed video networks by which mega-churches distribute their messages to believers. We can see from these examples how problematic and slippery such an argument is and how easily it could be applied to reject any new (or old but forgotten) religious or secular idea, object, or activity. Based on this notion, perhaps only the Amish are true Christians. Another objection frequently seen to out-of-body experience is that those who seek out-of-body experience are doing it for the wrong reasons. Christians seek faith in God through miracles, scriptures, prayer, ritual practice, ethical activities, etc. However, as an example, both prayer and out-of-body experience can be done for selfish (i.e., "O Lord, make me rich") or harmful (i.e., "O Lord, curse or destroy my enemies") purposes. These improper motivations do not make prayer into an evil practice just as improper motivations do not make all OBEs evil. Moreover, Christian critics of OBEs will often admit that people seek out-of-body experience for spiritual reasons. If a person seeks an OBE for spiritual reasons such as to increase faith or the knowledge of God and the supernatural world, we might ask, "How is this an un-Christian activity?" The answer is likely to be that these seekers are using the "wrong methods". Direct experience of God and the supernatural world may well be the most direct path to a strong and lasting faith. Objecting to it as being un-Christian is refusing to take "yes, I believe" for an answer. It reminds one of the mathematics teachers that object to students who get the correct answer to a math question but arrive at it using the wrong method. For some Christians, spiritual travel is the wrong method even if it leads to the correct answer (Christian faith). Given the lack of authentic religious faith in both the secular and the Christian religious world, the author's approach would be that church leaders should not be too picky about how people arrive at their faith but rather focus on the goal of having faith in the first place. There is a tendency in some Christian writers to lump all practices that are not clearly mainstream Christian practices into the categories of pagan or occult. To these writers, mediumship, Tarot reading, OBEs, and dowsing are part of the same category of occult experience. The above moral statement from Deuteronomy can be considered moot since most Christians do not follow Levitical and Deuteronomic moral law in the first place. For instance, Christians do not keep a Kosher diet but instead follows the moral law of the ten commandments which can be condensed into Christ's statement: "Love God, Love thy neighbor as thyself". To argue that good Christians should keep laws from the Hebrew Bible that they ignore or continually violate is to radically redefine what it means to be a Christian, which is not something Christian conservative writers generally want to do. But let us ignore this problem for the moment and address the objection to occult experience mentioned in the above biblical quote. The interesting fact is that of the numerous spiritual travel experiences mentioned on the pages of this site, none of them fits into any of the above-mentioned specific categories (with the possible exception of near-death experience where the person on occasion involuntarily meets with dead relatives or friends). 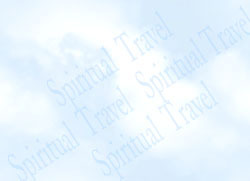 Spiritual travel as described at this site does not include divination, mediumship, spiritualism, spells, speaking with the dead, human sacrifice, or omens. Spiritual travel is simply not on the list of "detestable" practices. This leaves us to discuss the categories of sorcery, witchcraft, and the occult. The interwoven concepts of the occult, sorcery, and witchcraft can be interpreted so broadly as to be meaningless since they can include any religious activity that mainstream Christians do not approve of, practice, or understand. Because the definition of witchcraft is so vague, we can see how many thousands of Christians were burned as heretics based on their being judged to be witches. The medieval church courts proved conclusively that there is no way to defend oneself against the amorphous charge of witchcraft. The Salem witch trials reaffirmed the meaninglessness of the "charge" of witchcraft in a more modern context. So the "occult" objection to spiritual travel rests on the term's vagueness and imprecision. The terms "occult practice" or "sorcery" simply come to mean un-Christian practice, and the objection becomes a tautology since any un-Christian religious practice would certainly be considered "detestable" to a Christian God. Occult experience is objectionable to Christians because it is un-Christian which does not define what the term "occult" actually means. Such an objection, based on undefined terms as it is, has no merit from a philosophical point of view and therefore represents a meaningless objection. The last objection we see to OBEs is that they were only given to prophets to glorify God and communicate something important to believers on earth. The first problem with this approach is there is no way to know that this is true. Even if some or most of the OBEs in the Bible occurred to prophets or saints, those are the vast majority of the people spoken of in the Bible. Ordinary people who had such experiences would not be included in an extraordinary text like the Bible. Another problem is that such experiences "glorified God" and had no other purpose that prophesy. This is certainly untrue since the learning that occurred during these heavenly experiences had many other results such as increasing faith and giving knowledge of God and his heaven to individuals. Many individuals were given knowledge that they were forbidden to share with others. How is hidden knowledge supposed to glorify God and increase faith in others? 10 When he was alone, the Twelve and the others around him asked him about the parables. 11 He told them, "The secret of the kingdom of God has been given to you. But to those on the outside everything is said in parables..."
3 And I know that this man--whether in the body or apart from the body I do not know, but God knows-- 4 was caught up to paradise. He heard inexpressible things, things that man is not permitted to tell. Here, we clearly see that OBEs had a teaching function for the individual and not just the prophetic function to transmit messages to believers. Once we accept that individual knowledge of God is important apart from educating the group which is the function of prophets, spiritual travel can be accepted as a Christian religious practice beside numerous other Christian practices. Finally, we must deal with the claim that the OBEs in the Bible were controlled by God whereas the ones that occur to people today are not. Such claims cannot be verified. Who can claim to know that a person's spiritual experience is not "controlled by God". The individual would need to be a prophet in his or her own right to be able to make such a claim. There is certainly a vanity to such claims that seems to be very uncharacteristic of Christian commentators. Implicit in this claim is the belief that the "time of the prophets is over" and God does not give transcendent spiritual experiences to people today. To this statement the author can only respond, "O, ye of little faith ...".